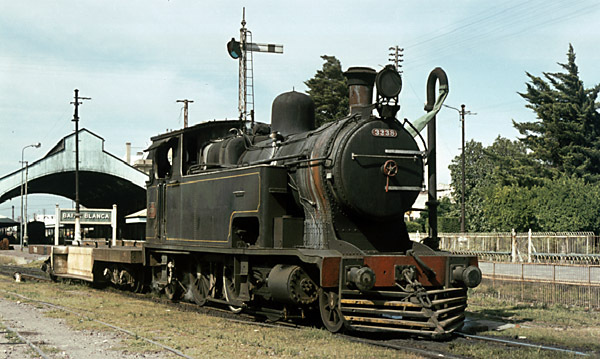 From the archive of Héctor Guerreiro comes this rather archaic looking locomotive, No 239, which was engaged on the construction trains when building the line to Neuquén. It had started life in 1883 as La Primera Argentina, No 48, of the FC Oeste and was bought by the FC Sud in 1899 for the Neuquén line construction. On completion of the line it, worked around Ingeniero White until its scrapping in 1906. Another photograph found in the same site. Clearly it is in Neuquén station. Is it also a class 6B? The wagon to its right is interesting; it is a 9.575 tonne tare brake van with a 5 tonne capacity for parcels. It was built by the Birmingham Carriage and Wagon Co in 1889; one survived long enough to be included in the FC Roca Z2 class of brake vans. The use of such road vans meant that a secure parcels service could be provided by goods trains in place of the more usual UK practice of using passenger trains. Another photo of an FCS 4-4-0, also with an extra water tank behind the tender (). With the increasing production in the Plaza Huincul oilfields came the need to handle heavier trains. Eminently suitable for heavy haulage with light axle loading is the Garratt. The FCS bought twelve Garratt 4-8-2+2-8-4 with a 12.7 ton axle load for use on the Neuquén line and for the grain traffic on the Toay line of the Bahía Blanca North Western. West of Neuquén are the steepest gradients on the Southern, and to deal with them there were special rules relating to block working, train formation and shunting (see Appendix 16 for the text of the relevant rules). Additionally some heavy, sixty ton, brake vans were acquired. These were called Class 17 and were coupled at the front of the train. Basic dimensions of the Garratts were: cylinders 17½" x 26"; driving wheels 4'-7½"; boiler pressure 200 lb/sq in; tractive effort (80%) 45,910 lb; oil capacity 8 tons; water capacity 4,600 gallons. A Beyer Peacock photo shows one of the Garratts before delivery. 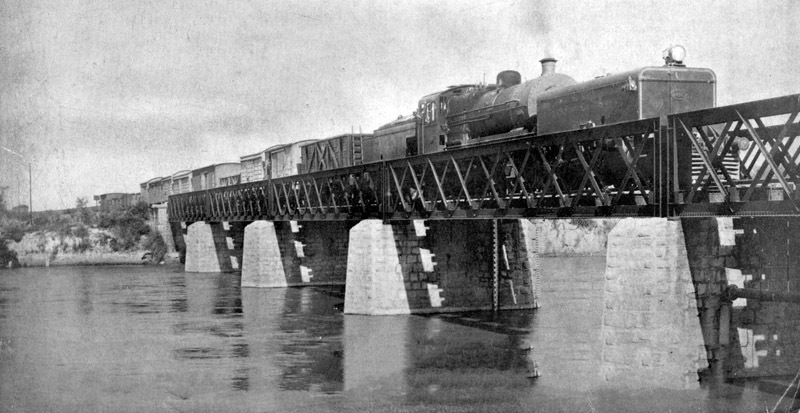 This clearly posed view shows one of the Garratts with a Class 17 brake van in charge of an oil train traversing the timber trestle viaduct between the big bridge over the Neuquén and the station of Cipolletti. This is a view of one of the Garratts at Ingeniero White shed, showing the openings at the rear of the cab. The Garratts were not outstandingly successful, partly because the loads they needed to haul to reap the benefit of their full power were too long for the loops. As a result they seem to have had a fairly short life. The Class 15A comprised 8 engines built by the Vulcan Foundry in 1939, four had Walshaerts and four had Caprotti valve gear. This latter valve gear was replaced by the Walshaerts variety during the Second World War due to the unavailability of spare parts for it. The Class 15B were an updated version: some 30 engines, also from the Vulcan Foundry, arrived in Argentina very shortly after nationalization. Apart from a weight in working order of 153.6 tons as against the 155.3 tons of the earlier ones, their principal dimensions were the same. The web site Por los rieles del Sud, with address <http://www.porlosrielesdelsud.com.ar/locoayer.html> (Not available in April 2012) has data on some of the FCS engines, particularly classes 15A and 15B (4-8-0 engines with bogie tenders) (5). The site has its origins in an article by Richard Campbell “Las locomotoras fruteras de los ferrocarriles Sud y Oeste”, in the Revista Ferroclub Nº19 of November 1994. (6). 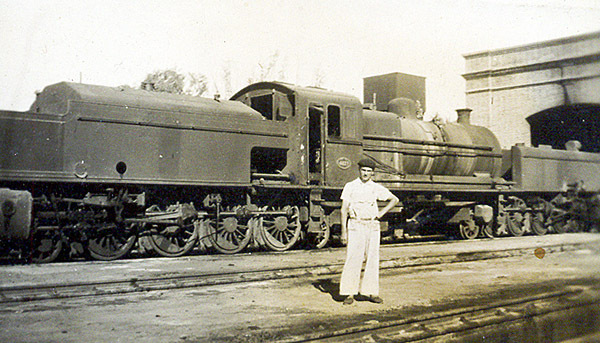 In later steam days the shunters in the Bahía Blanca area were the standard FCS 2-6-2Ts, as shown below. These were the Class 8A, built by the North British Locomotive Company in 1906 (3321-3342) and 1907 (3343-3354). One of these remains at the entrance to the Ingeniero White loco depot. 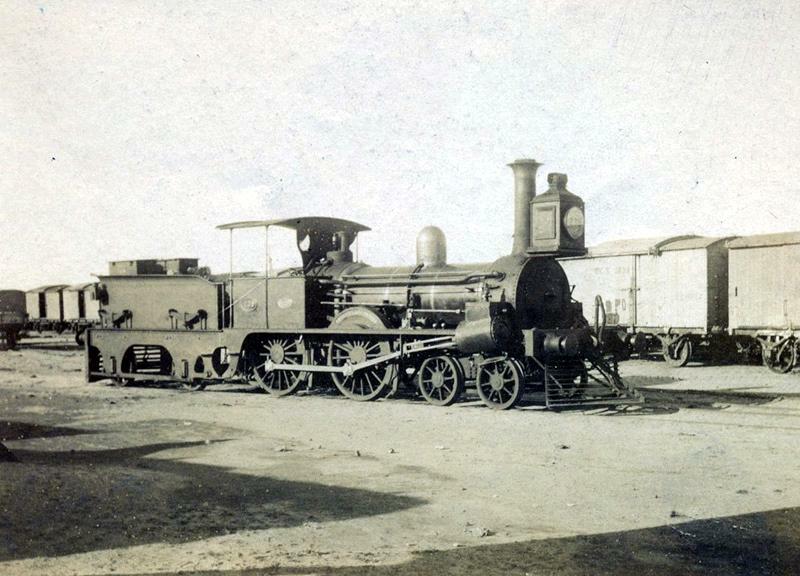 It is not known whether they often ventured west along the Neuquén line, though a picture exists of one at Contraalmirante Cordero at the narrow gauge exchange sidings. This picture was taken at the north end of Bahía Blanca station in 1975. In addition to these 2-6-2T, Ingeniero White shed at this time also had Class 11B 2-8-0 goods engines, built by a variety of builders in the period 1914-30, and some Class 8E three cylinder 2-6-4T also built by a variety of builders in the period 1923-30. 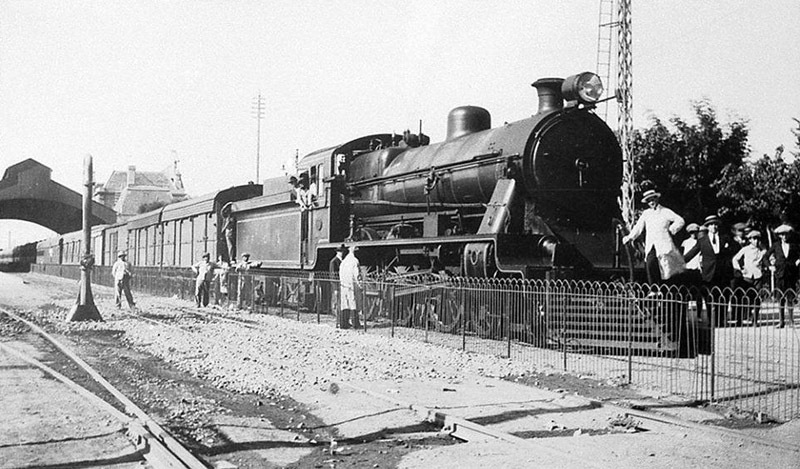 Neuquén, the other shed that served this line at the time, had some Class 12P 4-6-0 of the series 3201-3235, which had been created in 1948 from old compound engines of Class 12, built by Beyer Peacock in 1907 (3801-3820) and the North British Locomotive Company in 1907-08 (3821-3832), along with some Class 15B 4-8-0 as described above. In the early days all the locomotives used coal from Cardiff as fuel. As time went on, many were converted to burn crude oil. The coal was imported to Bahía Blanca, indeed the FC Sud owned and operated a number of colliers; however, rather than send them back in ballast they took whatever cargo they could secure, eg potatoes. In 1905 the FCS brought three steam railcars from the Gloucester Carriage and Wagon Company with a mechanism made by Kerr Stuart. The coaches had compartments for both first and second class passengers. They were fitted with buffers and with cow catchers (pilots) made up of iron rods. 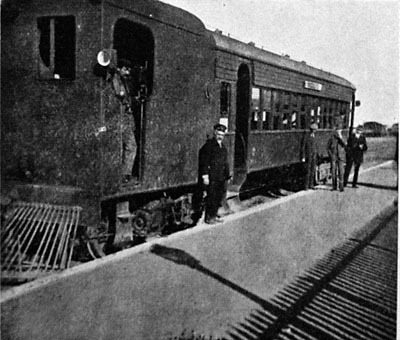 In 1912 one (Nº2) started running on a local service between Neuquén and General Roca. As this is the only broad gauge stock which we know about for the irrigation scheme, it is a little hard to know whether to include it here or along with the narrow gauge material. The writing on the un-cropped view notes the lines which made use of this Fairbanks-Morse No. 15 type trolley. The notes included a reference to a broad gauge one for MOP works on the Dique Neuquén – presumably to operate on the FCS lines! An occasional visitor to the line would have been this Drewry 100 hp petrol inspection saloon for the Engineer-in-Chief, intended for extended trips as it was provided with four sleeping berths, bathroom complete with shower and a fully equipped kitchen. Strangely although a berth was provided for the driver, no berth appeared to be provided for the steward. Héctor Guerreiro has kindly provided a view of this saloon in service at the north end of Bahía Blanca Sud station. The buffers, coupling and brake pipe allowed it to be attached to a train. On Saturday 6th July 1929 a special train sat in Plaza Constitución station. It was made up of two heavy saloons totalling 100 tons and the Southern Railway's first diesel electric locomotive, CM 201. It left at 23.10 hours, leaving the four track section at Temperley, then the double track section at Cañuelas, thence via an unusual route to Bahía Blanca via Empalme Lobos, General Alvear, then Olavarría at 04.27 hours, General Lamadrid and Pigüe to the start of double track at Saavedra and so through Bahía Blanca (Sud) at 09.52 hours, and on to single track again at Empalme Spurr Oeste; Río Colorado was passed at 12.58 hours, Choele Choel at 15.52 and General Roca at 18.58 before reaching Cipolletti at 19.45 hours, where it stopped for the first time since leaving Plaza Constitución after a run of 1239 km. 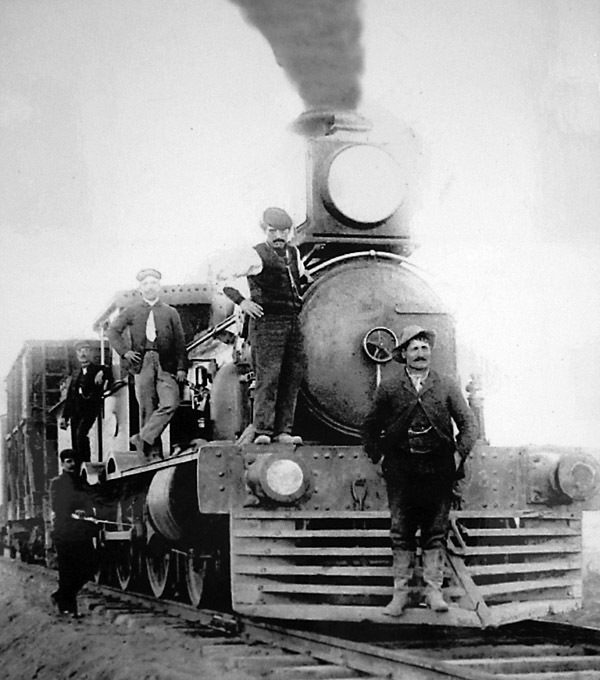 The locomotive had been designed by Ingeniero Pedro Saccaggio, Chief Mechanical Engineer of the Southern Railway. By modern standards the loco was small with a length of 11.38 metres over buffers, weighing 43 tons and Bo-Bo wheel arrangement. The eight-cylinder diesel engine of 375 hp revving to 700 rpm was made by Wm. Beardmore of Glasgow. 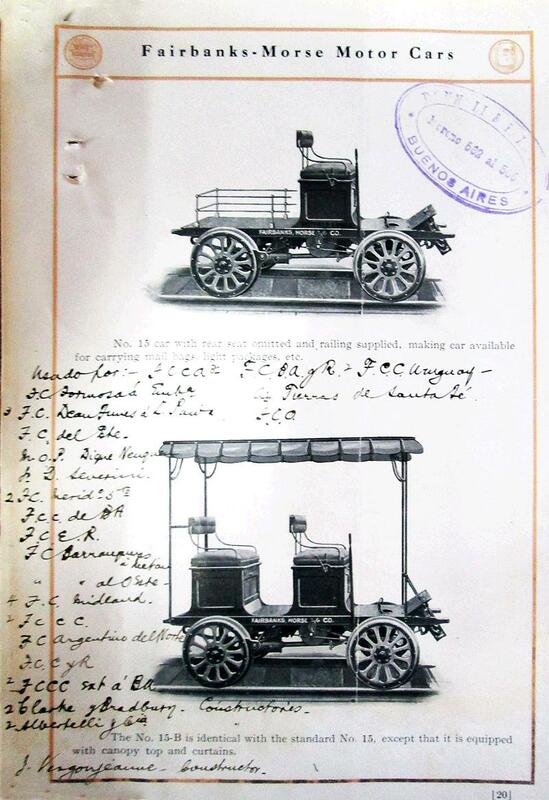 The bodywork was constructed by the Metropolitan Carriage & Wagon Co.
Information extracted from Ferrocarril Pago Chico Boletín N°38 at [accessed 4/12/10]. This view appeared in the Railway Gazette for 29 December 1933. It shows the special two coach train headed by CM201. 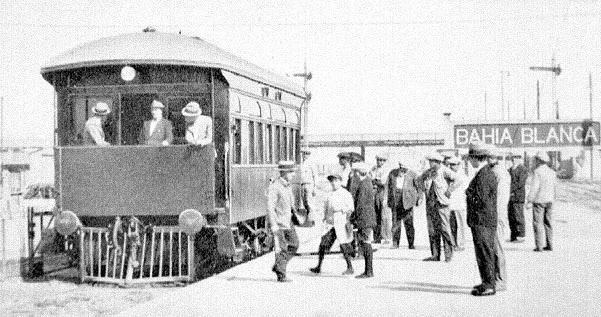 Until the take-over of the Bahía Blanca North Western Railway in 1924, the FCS did not have convenient workshops for the repair of the locomotives and rolling stock serving this line. These tasks were undertaken at the Remedios de Escalada workshops on the south side of Buenos Aires. To read more about this theme (in Spanish) visit the article of Adrián Graziano at <http://www.porlosrielesdelsud.com.ar/club/taller.html> (Not available in April 2012) (14). 0A From Facebook – Bahía Blanca en Imagines (28/5/15, no longer available). 0B Found in Restoration & Archiving Trust collection. 0C Contained in a commercial publication of the FC Sud. 1 British Steam on the Pampas. D S Purdom, 1977. Mechanical Engineering Publications Ltd, London & New York. Page 102. 1A Found in archive of Museo Nacional Ferroviario Raul Scalabrini Ortiz in Buenos Aires. 2A Construcción e Inauguración . . ., Chapter 2. Page 232. Mi Vida de Ferroviario Inglés en la Argentina 1887-1948. Arturo H. Coleman. 1949 Published privately. 3 British Steam on the Pampas. D S Purdom, 1977. Mechanical Engineering Publications Ltd, London & New York. Pages 74-77. 6 Las locomotoras fruteras de los ferrocarriles Sud y Oeste. Ricardo Campbell. Revista Ferroclub, Nº19, November 1994.